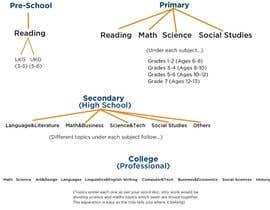 Currently, the list is long and repeats categories already listed within other levels of schooling. I need for you to devise a neat and simple hierarchy that will not confuse potential users that wish to post into or browse these sections & categories. I need the list to NOT be redundant and confusing. I have an extensive list of main navigation headings for a website. I need the list to work towards all international systems. (different countries have different levels schooling) I want the ages removed, and for it to make sense for every country. Be creative when it comes to reorganizing the list. TRY to find a better hierarchy so the information will not be confusing. You can merge fields and areas, do whatever you think it will take to simplify the list while still covering the broad areas of fields. Also, add the following subjects: law, medicine, & culinary arts. Within these 3 additional categories, create subcategories for each one. The first person to finish a list that I like will win the contest. That means I will end it sooner than the original time. Time is of the essence. If you finish a good looking, simplified list today, I will END the contest and award the prize to you! You can post screenshots of each section. A: Your budget is totally unacceptable. B: This should be a project, not a contest. C. You should take your non talented self somewhere else. D. You can't be BOTH a Freelancer and Freelancer Poliice. E. Make your damn mind up!